Dark blue long strapless dress, this custom female bobbleheads seated on the chair playing the grant piano, with charming smile on he face, oh god, she is so gorgeous! This customized bobblehead can give the piano learning ones more confidence and hope. Also a good gift to show your admiration for the piano player in your life. 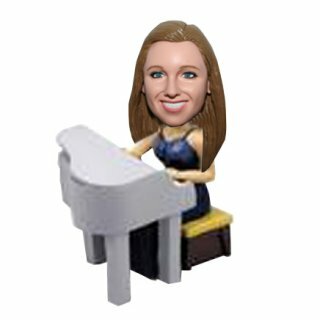 Piano itself and the player are both so charming that you really need this bobblehead! !